This is the best news that has come out of the Arab "Spring" yet. Secular Egyptians and even the court system are protesting the recent power grab by Muslim Brotherhood President Mohamed Morsi. It almost gives me hope that something good may come out of the Arab Middle East yet. Why is this a good thing? It seems that the more secular a Muslim is - the more pragmatic he becomes. He's willing to be more tolerant toward others with whom he does not agree. On the flip side of that, it seems that the more religious, or devout a Muslim becomes - the more intolerant he is. All of a sudden jihad becomes a leading tenant and the fight against the infidel moves to the forefront of his brain (or her brain - we don't want to be sexist, there have been female suicide bombers). It is in the US and Israel's interest to have a secular Egypt - they may not love us, but they'll work with us. A religious Muslim Brotherhood has other priorities - working with infidels would not be included in them. We should hold our breath as the crowds in Tahrir Square get larger. "Cease-fire" aka "Time to Rearm"
I reprint this article every so often when Israel finds herself in this situation - to remind us all what a "cease-fire" really means in the Muslim mind. In essence it's a chance to rearm and prepare for another war. What does Israel gain by accepting a cease-fire? Are the rockets from Gaza going to stop? The media is reporting that this conflict began about eight days ago... they're wrong. The conflict began when the rockets entered Israeli airspace, targeting schools and civilians - years ago when Israel evacuated all her citizens out of the Gaza Strip in a show of good will toward the "Palestinians". When the Jews left the Strip, the rockets began flying. I'm glad that 'land for peace' swap worked out so well for us. I do not ride the buses because I'm afraid that I'll be blown up. In fact, I rented a car here in Israel so I would not have to use the convenient and inexpensive public transportation system. My life and the life of every other Jew in this country has been changed because of the Arab occupation of this land. What about this "cease-fire"? Doesn't that mean that we are working toward peace over here in Israel? One would think so. But the Jewish woman who was blown up in her own home when a suicide bomber walked in might disagree. It was only a "splinter group" that took responsibility. Two days ago I was sitting at my friend's kitchen table in a suburb of Jerusalem playing cards. All of a sudden I heard shooting from the nearby Arab village. Did someone say something about a "cease-fire"? What is being touted as a "cease-fire" is something called a "hudna". A hudna is a tactical cease-fire that allows the Arabs to rebuild their terrorist infrastructure in order to be more effective when the "cease-fire" is called off. We must listen carefully to the double talk of Yasser Arafat and Abu Mazen when they call for peace with the Jews. Arafat has always used the peace treaty that Mohammed signed with the Quraysh tribe in Mecca in the seventh century as a model for his peace treaties signed with the Jews. But why should we care about a peace treaty signed hundreds of years ago? If we do not understand this important event, we will never understand the situation here in Israel. Israelis here were thrilled when the latest cease-fire was signed. 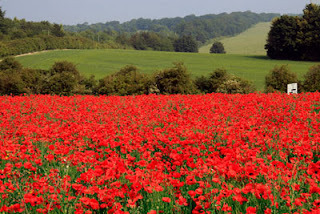 There were pictures in the newspapers showing our young soldiers jumping for joy. Unfortunately, they obviously do not know that a historical mistake is being replayed. It is based on the history of Mohammed and the tribe of Quraysh. Mohammed originated from the city of Mecca, which was being controlled by the tribe of Quraysh. But in 622 A.D. Mohammed fled to Medina after being forced from Mecca by the Quraysh tribe for preaching a monotheistic message. While in Medina, Mohammed signed a peace treaty with the tribe of Quraysh that "agreed to remove war from the people for 10 years. During this time...no one is to lay hands on another...evil [is] to be abstained from, and there is to be no raiding or spoliation." During the next eight years Mohammed concentrated on building his power base and was soon much stronger than the Quraysh tribe. The treaty quickly fell to pieces and Mohammed attacked the Quraysh tribe in 630 A.D. and took the city. The peace treaty was only a tactical tool against the Quraysh tribe. Here too in Israel we have the same situation. israel has signed peace treaty after peace treaty with the Arabs who occupy this country. These peace treaties mean nothing when Arafat compares them to the peace treaty between Mohammed and the Quraysh tribe of Mecca. This and every other peace treaty is based on the belief that it is acceptable to deceive your enemy if he is stronger than you. Peace is certainly an honorable goal, but it requires that all parties act honorably. When it is obvious that when the Arabs are not acting in good faith, a peace treaty becomes a death pact. The treaty of Mohammed and the Quraysh tribe is one to be remembered. The Arabs here certainly do. These numbers were posted on Facebook - to remind all of us that the Israeli attacks are only occurring in order to stop the rockets from falling, and are not indiscriminate attacks like those coming from the Gaza Strip. To show everyone that Israelis care about all human beings - even those who prefer to see every Jew dead. And just a reminder to all - Hamas was democratically elected. I have little sympathy for those who voted them in. I wrote this article back in August 2011. Nothing has changed - I could have written it today. Why? Why is Israel sending tons of "goods" into Gaza? Rockets are being sent into Israel indiscriminately, over a hundred in the last 3 days - people are being hurt and murdered - and Israel is sending goods into Gaza? It's almost a bad joke. 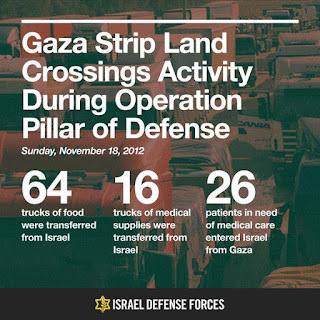 Does Israel think that sending goods into Gaza is going to make them our friends? We know it isn't going to happen. In fact, a poll of "Palestinians" in the "West Bank" and the Gaza Strip published last month proves the point. Just 34% said they accepted that concept, while 61% rejected it. Sixty-six percent said the Palestinians’ real goal should be to start with a two-state solution but then move to it all being one Palestinian state. Asked about the fate of Jerusalem, 92% said it should be the capital of Palestine, 1% said the capital of Israel, 3% the capital of both, and 4% a neutral international city. Seventy-two percent backed denying the thousands of years of Jewish history in Jerusalem, 62% supported kidnapping IDF soldiers and holding them hostage, and 53% were in favor or teaching songs about hating Jews in Palestinian schools. When given a quote from the Hamas Charter about the need for battalions from the Arab and Islamic world to defeat the Jews, 80% agreed. Seventy-three percent agreed with a quote from the charter (and a hadith, or tradition ascribed to the prophet Muhammad) about the need to kill Jews hiding behind stones and trees. So basically, these "people" are all for the kidnapping and murdering of Jews and establishing "Palestine" in all of what is Israel today. Yup, sending tons of goods into Gaza is going to do a lot for this relationship. What a waste. I just don't get it. This is beyond comprehension. These "Palestinians" are bound and determined to destroy the Jewish People and we're trucking in "goods" as good will gestures. They must be laughing at us. How stupid are the Jews? Come September when these wonderful, "peaceful" and tolerant people come to the United Nations to ask for a state - I'm sure they'll remember the good ole' days when the Jews were trucking in "goods" to help them out... even while they were sending rockets raining down on Ashkelon and Be'er Sheva. I'm sure that they really care. It's amazing that some still assume that the "Palestinians" in the "West Bank" are somehow different than the ones in Gaza. Again, remember that this poll includes both groups... and again, remember that Fatah in the West Bank and Hamas in Gaza are already in unity talks - which means that the United Nations will be thrilled to announce new terrorist states in the West Bank and in Gaza as well. Another bad joke. Since the "Palestinians" have decided to forgo all negotiations and treaties signed with Israel - Israel should say that all is null and void. It's time to annex Judea/Samaria (aka the West Bank) and end the Arab occupation of Jewish land. We have a 3000 year history the Arabs do not respect or recognize. If those Arabs living in Judea/Samaria cannot handle living in a Jewish State - they are welcome to leave. No one is stopping them. And as it's said - don't let the door hit you on the way out. Calls for "restraint" have begun. Yes, restraint. After months of hundreds of missiles raining down on Israeli heads - murdering, injuring and destroying - Israel finally decided to do something serious. They killed a top Hamas terrorist, best known for orchestrating the kidnapping of Gilad Shalit. Oh, it was then that the world decided to finally take notice of Israel's "aggression". Rather than cheering on the Israelis and complementing them on a job well done - we hear calls for Israeli restraint, even from the United States. Obama said Israel had the right to defend itself against Hamas' missile attacks from Gaza. But he urged Israel not to launch a ground assault in Gaza, saying it would put Israeli soldiers, as well as Palestinian citizens, at greater risk and hamper an already vexing peace process. "If we see a further escalation of the situation in Gaza, the likelihood of us getting back on any kind of peace track that leads to a two-state solution is going to be pushed off way into the future," Obama said. I wonder what message this sends to the democratically elected Hamas government in Gaza - the world won't say a word about the hundreds of rockets targeting school buses and innocents trying to live their lives - but when the world is made a safer place by the assassination of a chief murderer - "restraint" is called for. The message is clear: Jewish blood is cheap. Not only is Jewish blood cheap - we'll even reward these attacks by more "peace" talks, more talk of another terrorist state on Israel's border. A second "Palestinian" state - since Gaza is State #1. Don't escalate this war, the President warns Israel, we're trying to have "peace" talks with these terrorists - never mind that they don't have an interest in peace - just in seeing Israel and her citizens in pieces. No other nation in the world would tolerate even a single missile entering their airspace. Not the French, and especially not the Germans. Imagine the United States allowing such a thing to happen without an overwhelming response. But the world calls for "restraint" from Israel even after they've shown restraint - allowing hundreds of rockets to rain terror on her civilians without complaint. Jewish blood is cheap and the Arab world knows it. They know the world doesn't care about the Jews...go ahead, feel free to send the rockets. Calls for "restraint"? What a joke. Please donate to One Family Fund, a great organization dedicated to Israel's victims of terror. Today we commemorate Veterans Day in the United States and Remembrance Day in Canada. Please take the time to thank a veteran and take the time to support a veterans organization as well. These listed are only suggestions.